Q&A: Will Comcast allow you to have two cable modems in the same house? Question from Michael B: I’ve rented a room in a private home and I’ll be moving in next week. I have a question about my options concerning Internet access. The room I’m moving into is already wired for cable and they have Internet through Comcast/Xfinity, but the landlord won’t let me use his Wi-Fi connection. He said I’ll have to have to sign up for an account with Comcast and get my own cable modem. Which brings me to my question: Is that even possible to have two cable modems in the same house? I was under the impression that you can’t. Rick’s answer: Yes Michael, it’s indeed possible to have multiple cable modems in the same house, and it isn’t all that uncommon. All you need to do is call Comcast (1-800-COMCAST) and tell them you want to sign up for an Internet-Only account. Explain to them that the house is already served by an active cable subscription but your landlord isn’t willing to let you use his Internet connection. 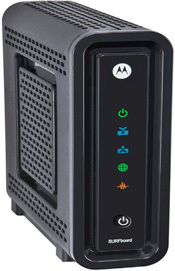 You’ll have the option of renting a cable modem from Comcast, but you can probably streamline the process by purchasing a modem of your own and avoid having to have a tech visit your residence. Just have the modem connected to both your router and the cable connection when you call Comcast in order to make the activation as quick and hassle-free as possible. Note: You’ll be asked for the modem’s MAC ID so it would be a good idea to write it down ahead of time on a piece of paper so you can refer to while you’re on the phone with Comcast. Depending on the model you end up with, you’ll find the MAC ID on a label affixed to either the bottom, the side or the back of the modem. I hope this helps Michael. Good luck! Do you have a tech question of your own for Rick? Click here and send it in!